My appetite as a pudgy infant was huge and relentless, meaning I ate almost anything anytime. That same appetite has driven me for decades. I’ve noshed my way through every phase of life, including a two-year period when I noshed my way through cooking school. To my surprise, I really didn’t learn recipes in cooking school. Instead I learned techniques, and those have made all the difference in my ability to grill. I am not suggesting that you spend two years and thirty-some thousand dollars on professional cooking school to raise your grilling game. 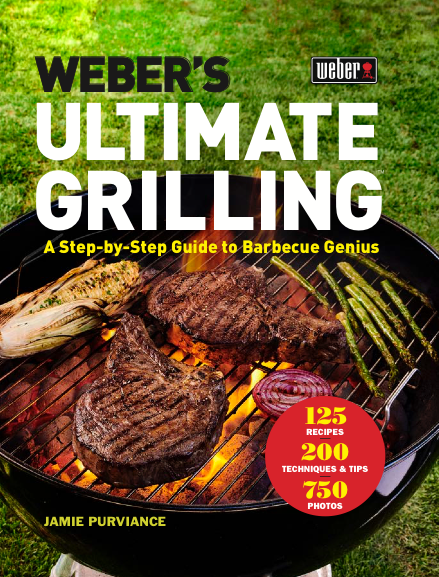 That idea seems excessive, but if you too have an appetite for great food, let me suggest a worthy alternative to school: “Weber’s Ultimate Grilling: A Step-by-Step Guide to Barbecue Genius” (April 2019). This is the most visually instructive book ever published on this topic ­--- packed to the margins with more than 750 pictures, leading you through every part of the recipes, with a BIG emphasis on techniques. This phenomenal amount of photography and an all-new recipe format make it really easy to learn techniques quickly and completely. Take, for example, a dish like Grilled Bruschetta with Marinated Peppers. If I were to write a recipe for that for an “ordinary” cookbook, I would try to explain most of the moves to make and maybe show how the recipe looks when it is plated, but a bunch of words and a single photo can’t possibly express all that you can see over the course of an extended series of photographs. Step-by-step images allow you to see how the fire should look, how the peppers should look during roasting and marinating, and how you should finish the recipe on the grill. This new format creates a much more informative experience. It is as if you are viewing the recipe in progress rather than just reading about it.